Simmon describes the experience of 'moral amnesia' under the influence of a sedative called 'plum bob' as 'a terrifying piece of alchemy'. Absorption of the drug leads to a lowering of inhibition, an amplification of emotion, a strange type of selective memory, and a particular kind of stupidity that makes nothing seem like a bad idea. On the bright side, the lingering presence of plum and nutmeg it leaves on the tongue is far more delicious than the almost-inevitable taste of regret. The taste stays with Kvothe in the immediate aftermath (referred to as 'plum echoes') and long beyond as a tempting excuse for indiscretions. The flavours probably wouldn't be far from our innkeeper's mind with each plum harvest by the Waystone. Preheat oven to 170°C (325°F) fan assisted. For the plums, combine the butter, sugar and nutmeg in a bowl to form a paste. Set aside. Halve the plums, remove the stones and lay inside-up in a baking dish. Divide the paste between the ten plum halves, putting a little blob just into the hollow left by the stone in each one. Bake uncovered in the preheated oven for 25 minutes. Meanwhile, make your crumble. Combine all the dry crumble ingredients (oats, flour, sugar and ground spices) before stirring through the melted butter with a fork. 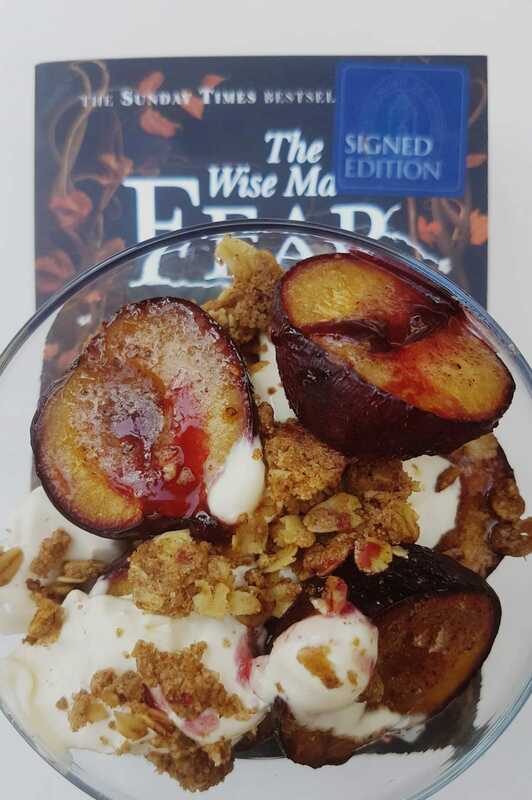 Lay the crumble mixture on a baking tray and bake for 5 minutes to coincide with the last 5 minutes of cooking time for the plums. 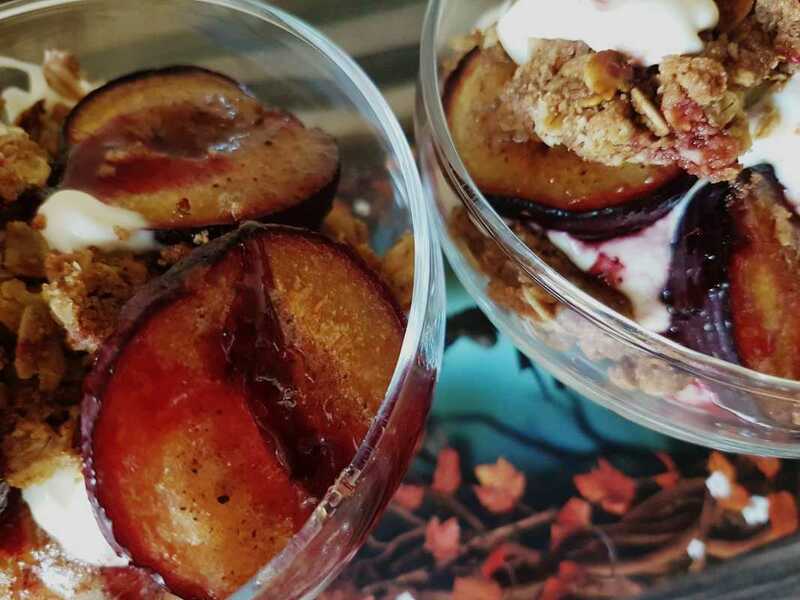 Remove the plums and crumble from the oven and leave them to cool to room temperature. Assemble the 'Plum Bob' Pudding once they're cooled. If using whisky, stir it into the cream before assembling the pudding. 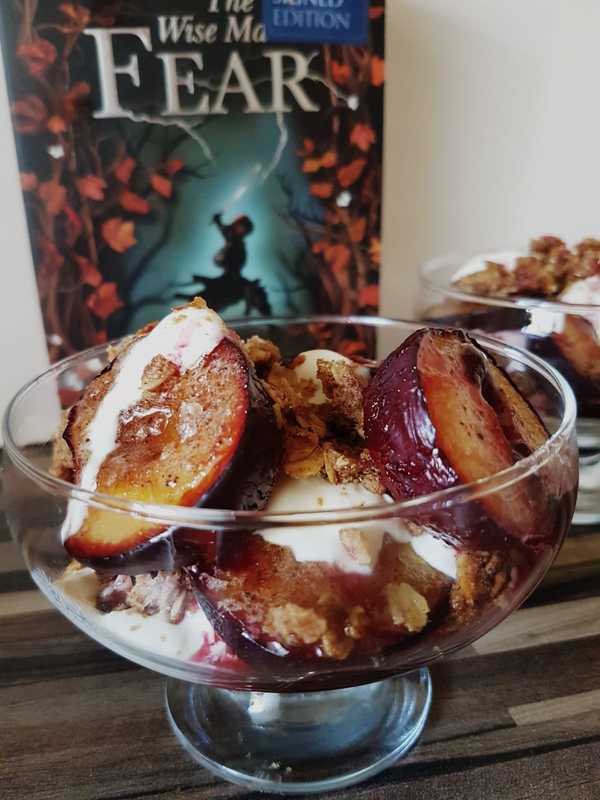 To assemble, serve 5 plum halves per person interspersed with crumble and (whisky) cream. To finish, sprinkle over any remaining plum juice from the baking dish. 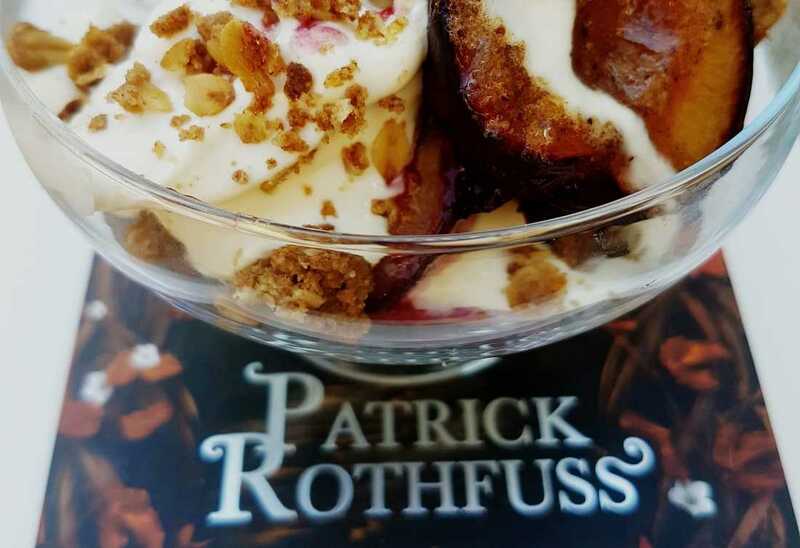 Click here to return to the list of Waystone puddings inspired by The Kingkiller Chronicle.